Learn more about how Congero Technology Group can help you maximize your Oracle investment with our consulting services. Congero Technology Group is an Oracle Gold Partner who specializes in implementation and integration of the Oracle Monetization Cloud platform. 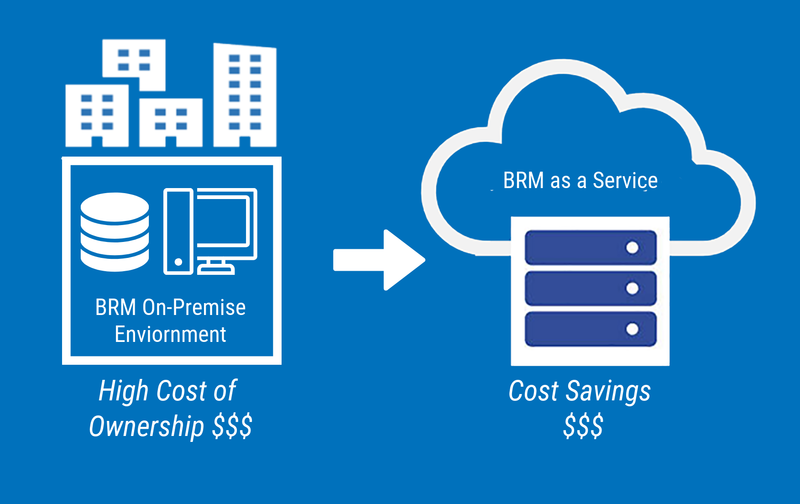 OMC offers cloud billing for subscription services for a variety of digital business models from basic recurring revenue to usage based service model. Congero Technology Group is one of the few authorized resellers and distributors of OMC which means we are a trusted one stop shop for OMC. 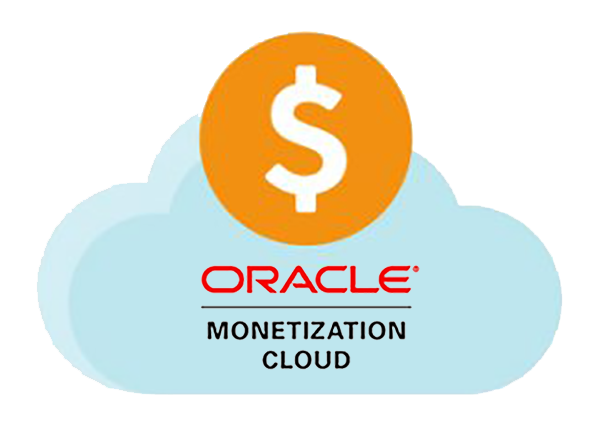 Congero Technology is also one of the few oracle partners that are certified by Oracle in implementing and integrating Oracle Monetization Cloud. Our consultants have extensive expertise in billing and subscription management in support of the full customer lifecycle. We offer a flexible pricing model to keep your implementation costs down. Contact a Congero expert today! 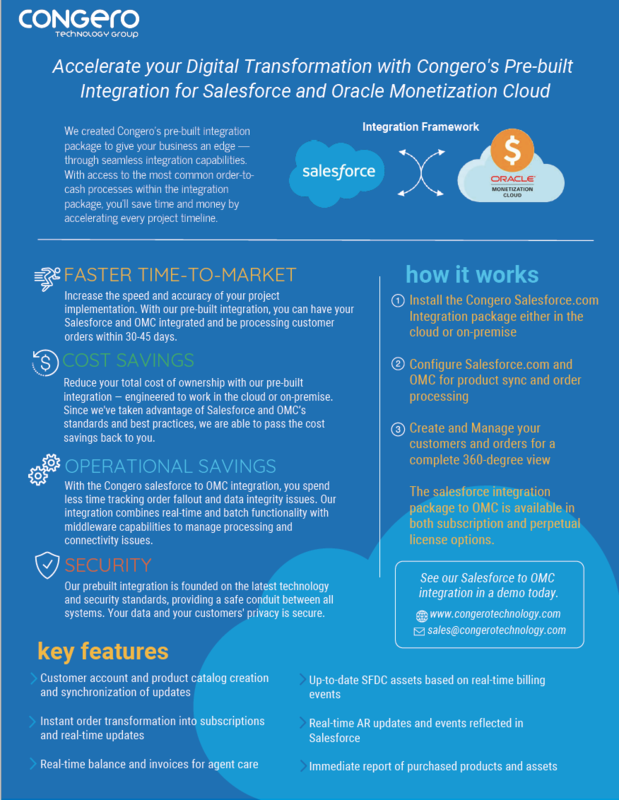 Download our Salesforce for OMC Integration data sheet here. Contact a Congero Solution Specialist today to see a live demo of our Pre-built integration for Salesforce.com and Oracle OMC! 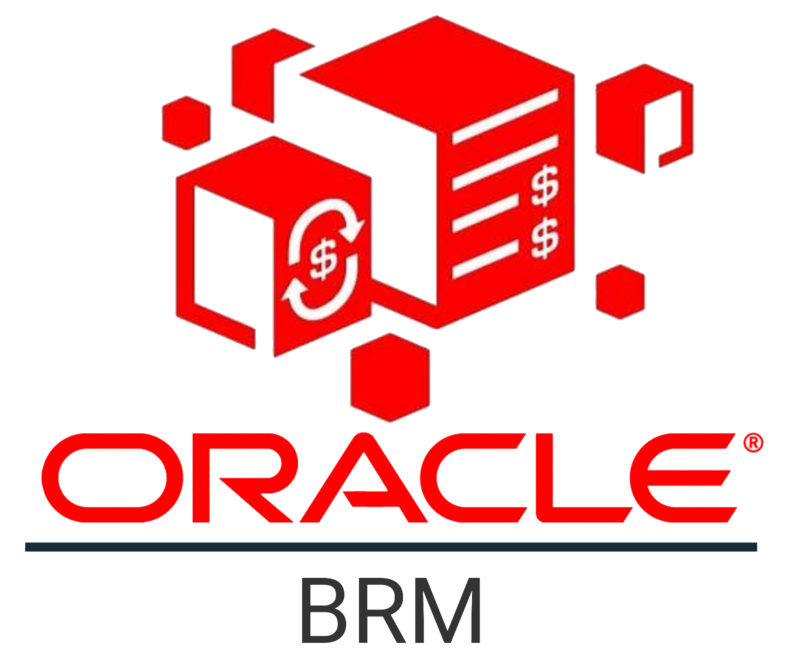 Oracle Billing and Revenue Management (BRM) provides a complete end to end on-premise solution for managing revenue, supporting key business processes that incorporate generation, caption, collection and assurance of revenue. Congero Technology Group has been providing Oracle BRM implementation and consulting services for over 11 years for many of Oracles customers. We are the leader and preferred Oracle Gold partner for supporting Oracle BRM installations and projects in North America. 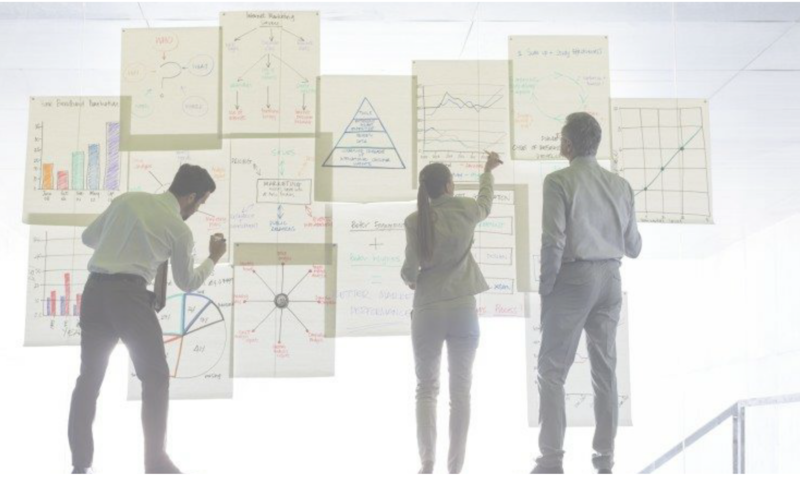 See why some of the largest companies use Congero Consulting for their BRM needs. Hesitant To Switch to a Cloud Billing System? Let Congero Technology Group transform your on premise billing and revenue management production and non production environments to a cloud services platform that you run from the cloud. Congero Consulting can fast track your migration to the cloud anywhere from 3 to 8 weeks based on your BRM on premise complexity and because we have fully automated the migration processes, we are able to offer this service at an affordable cost. To learn more about our fast track delivery model click here. Contact a Congero expert today. Oracle Live Experience Cloud delivers an in-app engagement and a better customer experience. 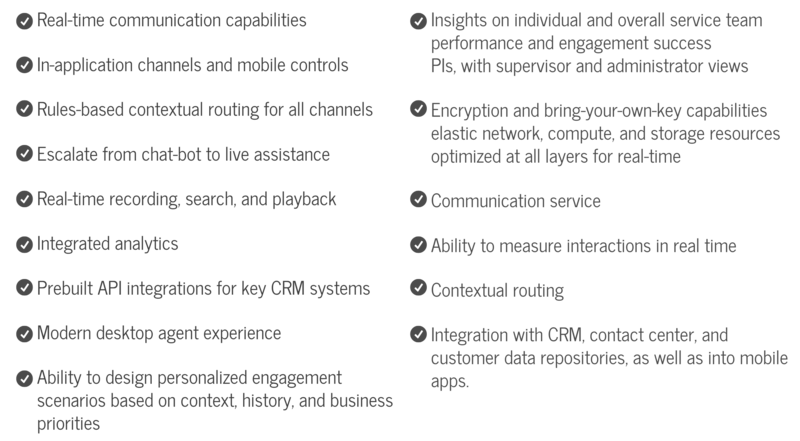 Oracle Live Experience Cloud integrates into web and mobile apps for seamless support including integration to Oracle Monetization Cloud and CRM applications. With Oracle Live Experience Cloud, you can now digitally deliver a seamless customer experience in real time. Your customers will be able to experience a faster assisted agent interaction without having to leave the web application. For more information on Oracle Live Experience Cloud visit Oracle’s Product Page here. Speak to a Congero Solutions specialist today for a real time demonstration of Oracle Live Experience Cloud. Need BRM Training for your staff? Congero Technology Group offers a wide variety of BRM training from the pricing analyst to the developer. Our training can be structured to fit the functional role of your organization and be rest assured that your team will gain the expertise needed to perform their job function using Oracle BRM. What does our training cover? We have structured training courses that include course material, hands-on labs, and exercises to ensure your team receives the proper training needed to perform their job. The following courses can be offered onsite or at our training facility in Kansas City, MO. Please contact us today to speak to one of our Congero Training Specialists to help you design the right training course for you team.